Have you ever identified yourself as something, lived and breathed it all your life, and then told you’re not really what you believe yourself to be?I’ve always called myself a Muslim, but recently the Muslim Council of Britain (MCB) made a statement about me, saying the beliefs I follow mean I “cannot be eligible for affiliation with the Muslim Council”. What’s my offence – am I neglecting my prayers, or not eating halal meat? No: I’m a member of the Ahmadiyya community. Ahmadiyya Muslims believe their founder Mirza Ghulam Ahmad was Islam’s Messiah and Mahdi, who came to revive Islam, reform Muslims and bring humanity back to God. But because other Muslims will not accept any more messengers, the MCB have declared me and fellow Ahmadiyya Muslims as non-believers. I know what I am. 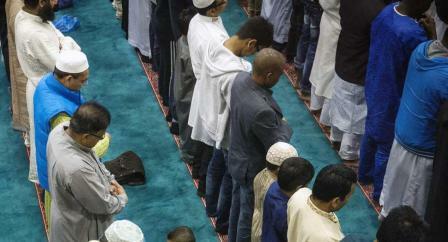 As a young boy, I regularly went to the mosque, and often made the call to prayer. I loved attending religious classes and was addicted to reading about Islam, especially the life of the Prophet Muhammad. I was in secondary school when my father wrote a response to Salman Rushdie’s The Satanic Verses and other books that vilified the Prophet. This inspired me to write about my faith too, and defend the Prophet’s honour whenever and wherever he was insulted.Soon after graduating, I got married to my wife, who has always proudly worn the hijab. We have three beautiful children and continued the same tradition as our parents in raising them – teaching them the Qur’an and Islamic etiquettes, and going to the mosque. My eldest son has already decided that he wants to become an imam! All my life, I have believed in the five pillars and six articles of faith. Furthermore, my community requires me to make the Qur’an and hadith my guiding principles, to invoke blessings on the Prophet, and to put Islam above everyone and everything. Whenever I leave the house, I wear a ring with the inscription ‘Is Allah not sufficient for His servant?’However, while I fulfil all the descriptions of a Muslim given by Allah and the Prophet, the MCB says that “Muslims should not be forced to class Ahmadis as Muslims if they do not wish to do so”. But their own criterion for who is and isn’t a Muslim has no basis in the primary Islamic sources. It’s also inconsistent with the belief of the majority of Muslims, including their own affiliates that Jesus – a Prophet – will come again in future. Why should this even matter to an outsider? The MCB has for long been a credible organisation, representing several mosques and Islamic groups, and done a lot of valuable work on behalf of Muslim communities across the UK. But their recent statement has wider, and potentially dangerous, implications for us all.When Muslims start playing God in this way, religious prejudice, bigotry and hate will inevitably rise – including here in Britain. The MCB claims to be committed to “pluralism, peaceful coexistence and extend a hand of friendship and cooperation for the common good of all”, but seems to have a different rule when it comes to Ahmadiyya Muslims. They appear content to regard extremists like the murderer of Asad Shah and hate preachers as among their co-religionists, but not those who live by the motto ‘love for all, hatred for none.’Whatever the theological differences, no individual or institution has any authority to dictate what anyone else can and cannot call themselves. My faith is a matter between me and my Maker. Freedom of belief and the right to self-determination are among the cornerstones of any progressive society. The Prophet Muhammad certainly stood up for those rights – one hopes bodies like the Muslim Council of Britain does too. Share the post "The Muslim Council of Britain has officially decided I’m not Islamic enough – but I never did anything wrong"